Some time ago I received an email from Jean-Pierre Favreau, a gentleman from Paris who reads the blog, enquiring if I might put him in contact with George Fèvre, a man I knew from my days in Paris. 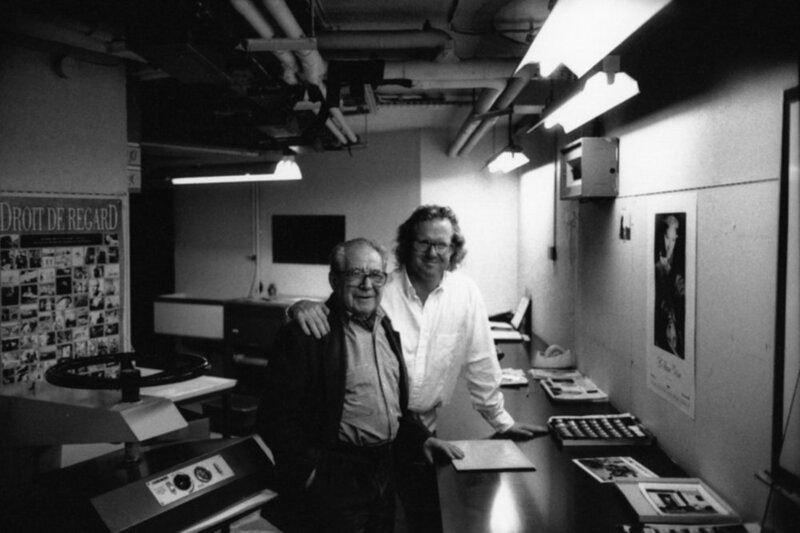 George had been the master printer at PICTO, the venerable Parisian photo lab that handled Magnum’s film output. If you’ve seen a Cartier-Bresson or Koudelka print on exhibit somewhere, George probably printed it. In addition to being an amazing darkroom printer, George was a wonderful man. It turns out that Mr. Favreau had worked at PICTO with George many years ago. Unfortunately, I had to inform Mr. Favreau that George had died a few years ago. I asked Mr. Favreau if he would tell me of his time at PICTO and he kindly sent back a reply (and also a piece he wrote about first visiting NYC as a photographer in 1981 which I’ll someday get around to publishing as a separate piece). I’ve translated his reply from the French and have included it here below. For some context: In January 1950, Pierre Gassmann opened PICTORIAL SERVICE in Paris’ 7th arrondissement, six enlargers arranged around a long tank tray. Lucky him – his first clients were the founding members of Magnum Photos – Henri Cartier-Bresson, Robert Capa, Chim, William Klein, Willy Ronis, Robert Doisneau, Edouard Boubat. The Magnum guys soon dubbed Gassmann’s lab “PICTO,” and Gassmann eventually embraced the name himself. PICTO thereafter grew with the rapid development of press, fashion and advertising photography in the 50’s. In 1963 Edy Gassmann, son of Pierre, opened PICTO Montparnasse dedicated to color photography. With the help of Paulette Gassmann, his wife, he ultimately created multiple PICTO sites dedicated to specific services. PICTO Front de Seine opened in 1969 followed in 1984 by a high-end print workshop in Rue de Rennes. In 1985, Edy opened PICTO Defense, one of the first European labs handling digital technology. 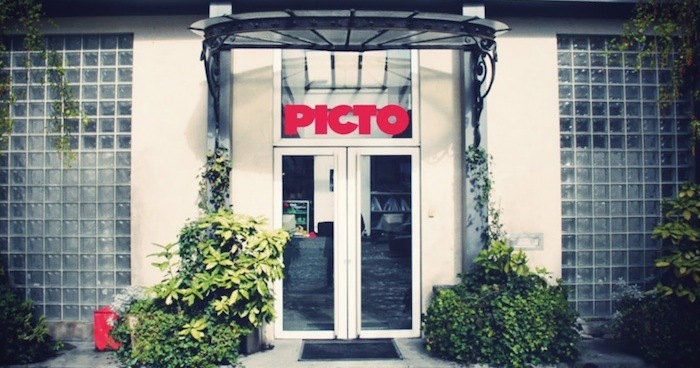 in 1989, PICTO Bastille opened, dedicated to black and white and Fine Art photography. At the time I started working at PICTO I didn’t know that it was one of the most prestigious labs in the world. I was young and ignorant. I had first arrived there in the mid-60’s, via Vavin Metro station, then onto the Boulevard Montparnasse, past the Dome and into Rue Delambre. A few steps later I arrived in front of a beautiful building where PICTO had recently moved. I was met by George Smith. Mr. Smith was a charming man, smiling and polite. Very intimidated, I explained to him my situation – I’d like to work in his photo lab. At the end of our conversation, he asked me to do an internship in one of the labs to learn a bit and to see how I’d do, and then I would take a test the following week to see if I was skilled enough to work there. That day I met Cartier Bresson, Brassai, Boubat, Koudelka and Lartigue. When I think back on it now I’m astonished that I worked with greats like them. Luckily, I passed my test. George then introduced me to Pierre Gassmann, founder of PICTO , himself a great photographer. Mr. Gassmann hired me; I suspect it was actually a favor because he did not really need anyone else. It was then that I met George Fèvre. George was the great PICTO printer. It was the golden age of PICTO, daily servicing 15-20 Magnum and other Black and White shooters, without counting the night service. We worked like crazy. Often Mr. Gassmann, after periods of great activity, especially the fashion shows which lasted a week, would take us all out to dinner at La Rotonde or La Coupole. Those were fun times. 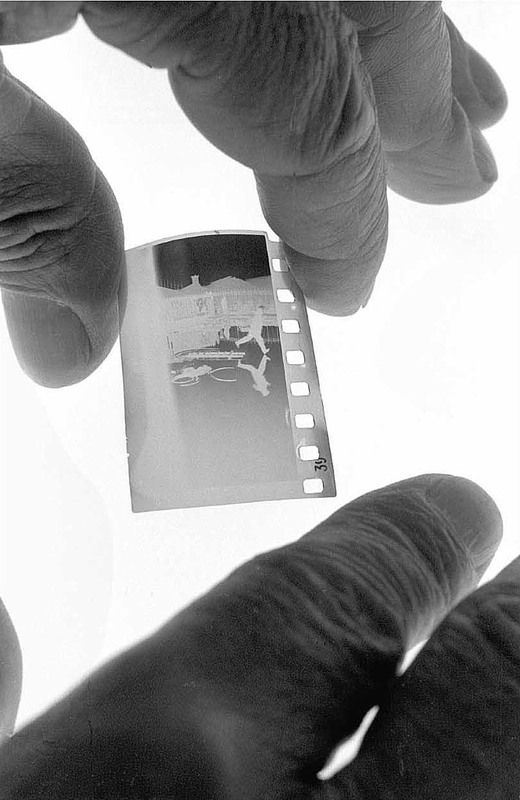 A famous negative. Those are George Fevre’s fingers. PICTO eventually launched three other labs in Paris, and I eventually moved on to different things. Today, after the invasion of digital, it only has one lab dedicated to traditional silver halide processing and printing. I ran across George Fèvre again only a few years ago. George always had this kindness and a warm smile in his eyes. He told me he was thinking of opening his own lab and seeing my satisfaction, offered me a job, which astonished me – his typical generosity . But travelling as frequently as I was at the time, we never again met up and I heard no more about George. On learning of his death, I was seized with a great sadness and blamed myself for not visiting him more often. We often forget that the people who’ve helped us the most, and have been influential in our lives, may one day disappear. I would have loved to see him again, to talk about those good years and the famous negatives that passed through his hands, from which he created iconic prints with his incredible skill. I will miss him. This entry was posted in Leica History, Uncategorized and tagged George Fevre, Jean-Pierre Favreau, Magnum, PICTO on January 31, 2017 by Leicaphila. This is a great story with a very applicable lesson to us all. Thank you. A simple, but great reminiscence. It is funny how such stories, including folks of note, make me think of the value of personal relationships in my own life. I am sure, as with everyone and every situation, there were times of pressure, aggravation, and conflict, but in the final analysis: “Those were fun times.” It is funny, adversity and dissatisfaction always seem to steal the present, but ultimately surrender to fond memories with the passage of time. A great lesson for all. Totally agree with Howard’s comment above. This is a lesson we should all learn to heed, and reading about arguably the greatest photo lab of the era is a joy in itself. Good to know there is still one lab dedicating itself to silver photography.